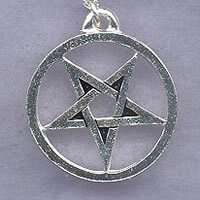 Inverted Pentagram Silver Finish Pewter Pendant w/ Chain. Intention: For Channelling Higher Energy Into Material Manifestation. Associated since the 19th Century with Satanist and known as The Devil`s Goat, this symbol is in fact far older and can be found in ancient Masonic Temples. In Wicca, it is a symbol of the 2nd degree and Magickally it represents the Dog Star Sirius and may be used to channel higher energy into material manifestation. 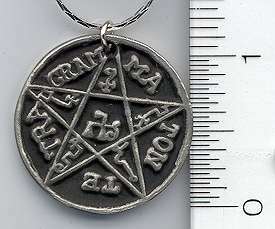 This silver plated lead-free pewter pendant jewelry design contains an inverted five pointed star Pentagram within an outer binding circle, all in an open jewelry design. 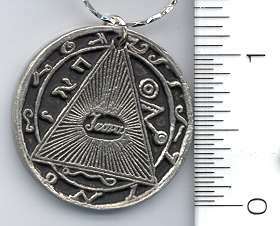 This pewter pendant recalls an ancient piece of occult mystical jewelry that will instantly convey your Magickal Intention wherever you wear it. Note: This is a powerful piece. Unless you are very well adept with the Magickal Arts, leave this Talisman unempowered. 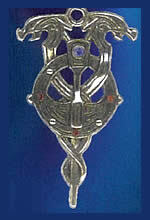 Material: Lead-Free Pewter w/ Silver Plate. Includes: 18 inch (450 MM) chain.